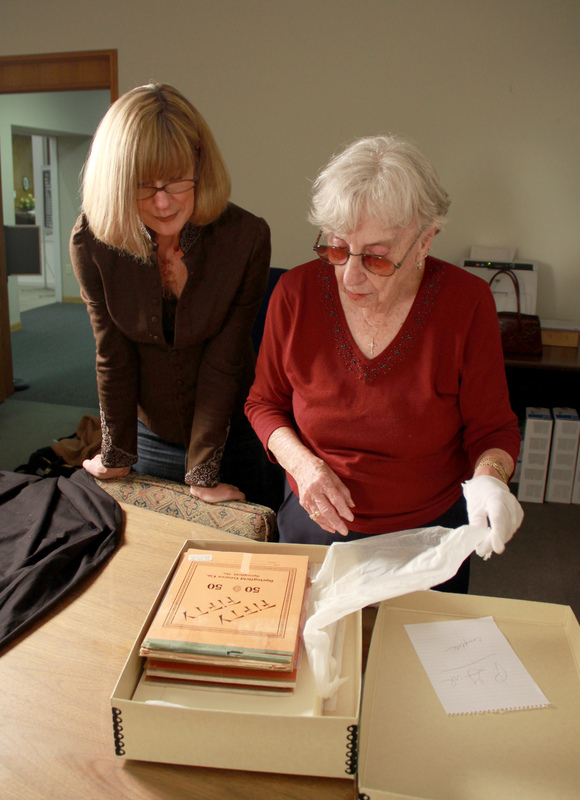 When Pamela Smith Hill and SDSHS Press director Nancy Tystad Koupal visited Rocky Ridge Farm on a research trip, they took time to examine Wilder’s library. 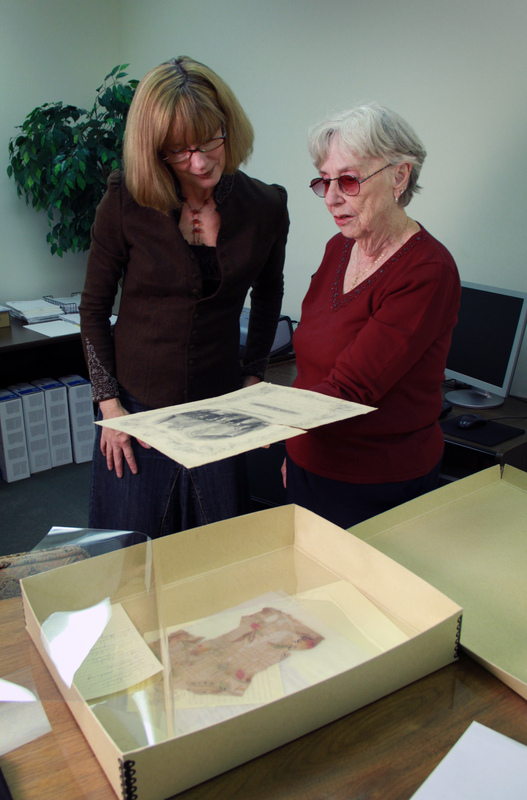 Jean Coday, director of the Laura Ingalls Wilder Historic Home and Museum, and editor Pamela Smith Hill unwrap the carefully stored original manuscript of Pioneer Girl. Editor Pamela Smith Hill takes a moment to look at Ma and Pa’s wedding certificate outside of the bank vault where it is held. First off, THANK YOU, to the Press and Nancy and staff, and esp. to Pam, for writing the wonderful bio of LIW, that “I” caught the first “type-o” when I received my copy of it directly from the Press…that was very well written and arranged, organizing her life, in writing the books, to a “T”! By the wonderful videos, and this entire website, I can clearly see that Pam is at work, arranging and organizing this project, just the way, I, myself or Nancy Cleaveland would do so. I realize that this is not an easy process and task, and very time consuming, and I feel that Pamela Smith Hill is a wonderful and talented writer/editor/annotator to perfectly design this masterpiece, that has been buried for many years, into book form for todays readers. I know and trust that she will make Laura’s own handwritten bio come alive and it will certainly be “the voice from the grave”! Next, I would like to personally offer any assisance or/and direction that anyone would need, for any reason, pertaining to Laura, Rose, or Little House, in general. Nancy Cleaveland and I have researched for years, every aspect of LAURA’S and ROSE’S life, and have covered more ground than meets the eye. If possible, I would definately request to REVIEW this work, possibly before publication, as for suggestions or comments, etc., from another Little House historic researcher’s point of view, only to note that all is accurate and uniquely researched. As you all may know and realize, you are “making history”, and I definately want to become a part of it, with you, in any way I can be assisance. We own each version of this rare manuscript, and have also examined it again and again. In 2013, SDSHS Press will make HISTORY! I trust this will be the largest project and best “Little House” book of all times. I sincerely THANK YOU for your time and consideration of allowing me to be a part of and help in any way I can, in this book and project! Hi there….. What books did Laura ingalls wilder have in her library? Thanks! I was a huge fan growing up. I’m so excited for the autobiography to come out. I’ve learned a lot just from this blog and links provided. Thank you for all of your hard work! ! Do you have a new publication date of when the book will be coming out? As a child I loved Laura and her books and I still love them and would love a copy of this book when it comes out! Lori – We have not yet announced a new release date for Pioneer Girl, but the announcement will come on this blog. Do check back periodically for the latest information. Is there any news on when “Pioneer Girl” will be available for purchase? 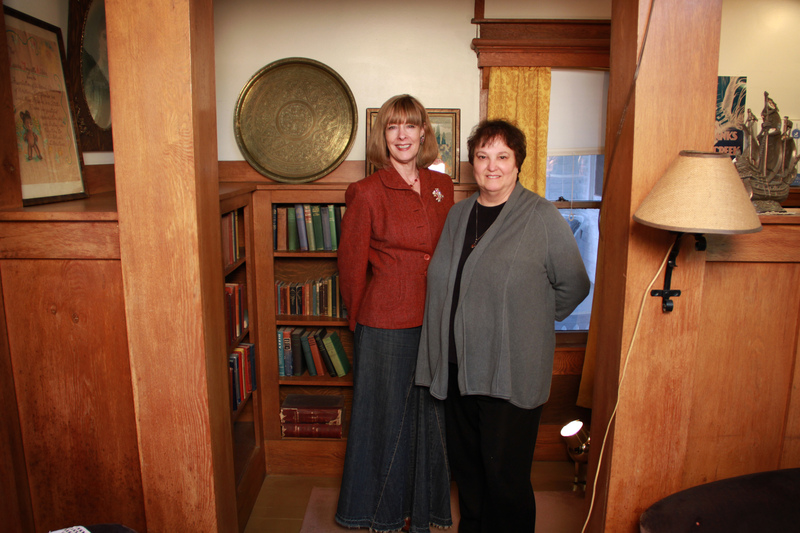 @Stephanie…We need to request that the Wilder Home Association provide a listing of Laura’s own personal library (book collection) in her home(s), on their beautifully re-organized website, http://www.lauraingallswilderhome.com/. Many readers and fans ask this question, and they should definately post this in a newsletter or their website for inquiring minds want to know!! Thank you for all the hard work you are putting in to get this published. Will it be coming out in kindle format? I find it difficult to read big heavy books at the moment as I have a young baby, but a kindle version would be just wonderful as I could read it anywhere. Thank you for your question. Along with making Wilder’s unpublished memoir widely available for the first time, Pioneer Girl: The Annotated Autobiography will add valuable context through photographs, annotations, maps, and appendices. We do have plans for an eBook version of Pioneer Girl in the future, but creating an eBook will require restructuring, so we will probably not be releasing a digital format at the same time as the print version. You are wise about not publishing an e-book too soon. My book Titanic: One Newspaper, Seven Days, and the Truth That Shocked the World was heavily foot noted, and when first released in e-book form, was totally incomprehensible because the notes where placed nowhere near the material they were related to. It was a Titanic disaster.